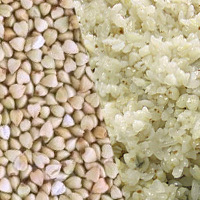 Buckwheat is the seeds of soba with husks removed. It can be cooked alongside steamed rice for added flavor. Buckwheat is not related to wheat but instead closer related to rhubarb. It is used to make soba noodles. The calories in Buckwheat per 100g(1serving) is 364 calories. Buckwheat is calculated to be 364Cal per 100 grams making 80Cal equivalent to 21.98g with 73.7g of mostly carbohydrates、9.6g of protein、2.5g of fat in 100g while being rich in vitamins and minerals such as Magnesium and Copper.